When Z Wallis closes this year, it will be the first time in about 45 years that a military surplus store hasn't been at 4643 N. Broadway. UPTOWN — The departure of a business in Uptown is often accompanied by residents' grumbling about how the neighborhood is headed downhill. The arrival of a new business often sparks cheers about how Uptown is on the up and up. 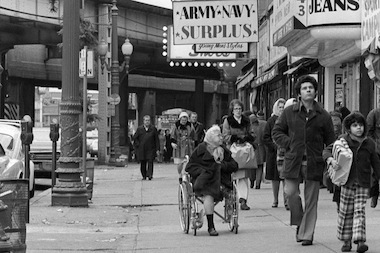 Wherever you stand in that debate, Uptown is much changed since the 1970s, one of the grittiest periods in its history — yet, a lot has stayed the same. The following pictures from that era, taken by ad executive and shutterbug Bob Rehak between '73 and '77, show local businesses and buildings that are no more as well as those that have endured shifts in the neighborhood. The landmark Uptown Broadway Building at 4703-4715 N. Broadway remains, but the businesses housed there are all gone, including Florsheim Shoes, Uptown Records Tapes & Phono, Uptown Camera and Majestic Menswear, whose facade remains despite it being empty. The building now houses offices for Children's Memorial Hospital, and real estate firm @properties. This fall, a retro-themed entertainment venue named Uptown Underground is coming to the building. The former 13-story Uptown National Bank building (left) still towers over the heart of the entertainment district — only it's now the Bridgeview Bank, which is under renovation. When Z Wallis closes this year, it will be the first time in about 45 years that a military surplus store hasn't been at 4643 N. Broadway. The current owner's father in law opened it in 1969 before selling it to him 15 years later. The clothing store that was next to it in this picture is now neighborhood favorite Gigio's Pizza. 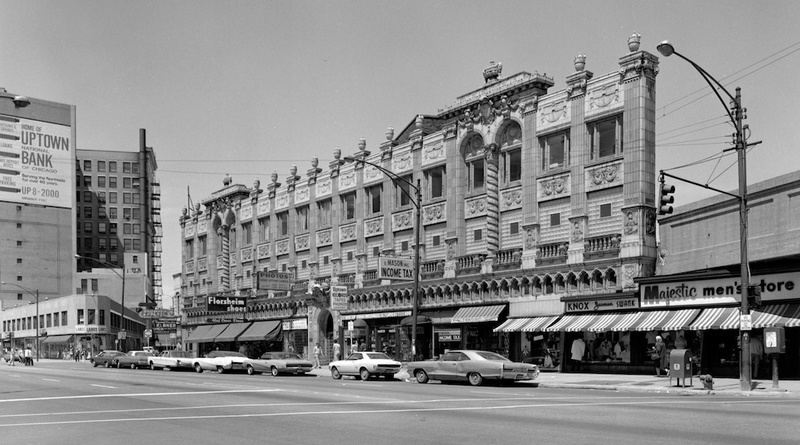 "This shot was taken on the west side of Broadway looking north toward Leland in 1975," Rehak wrote in the caption. "Note the one legged lady in the wheelchair. She appears in several other photos in this portfolio. I often saw her in this section of Chicago’s Uptown during that era. This shot was taken in December. Christmas decorations had just appeared on the light poles." The Buena Park Grocery store at 1052 W. Buena Ave., across from Buena Circle Park, is now a storage facility. 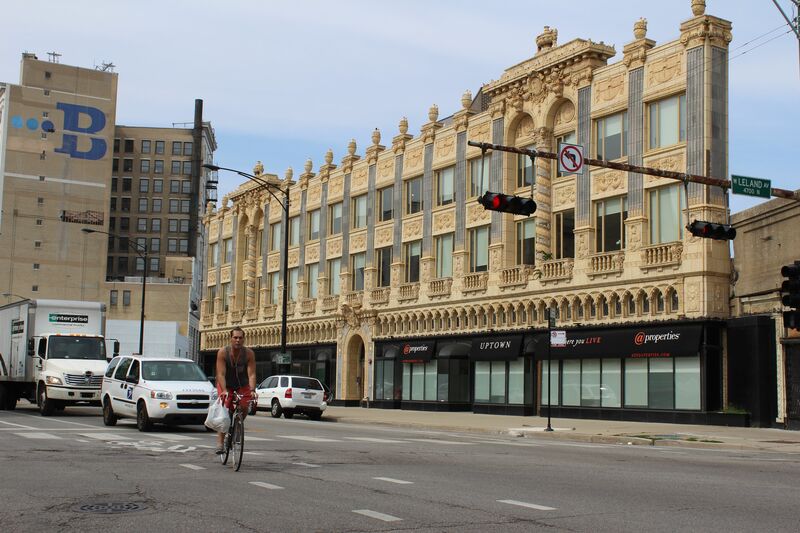 "During four years of photographing in Uptown, shops like this were the closest thing I saw to today’s supermarkets," Rehak wrote in a caption for the grocery store. "They were more like today’s convenience stores, which even today are hangouts for neighborhood kids. This store, Buena Grocery, was tucked away near Buena Circle Park right next to the ‘L.’ Kids left their dogs at the door while they went in to buy snacks." Do you have a cool old Chicago photo you'd like to see us use for Throwback Thursday? Email us or tweet us @DNAinfoCHI.